"Why isn't my naivgation working! Oh, the app isn't open"
Google, it seems, needs to find a route to resolve and apparent GPS issue being experienced by owners of its new Nexus 7 tablet. Multiple users have taken to Google's support forums complaining the devices location services are only working for a short period of time, before completely and irrecoverably dropping off. Each of the complainants say the GPS works fine for a certain period of time - some say a couple of minutes, others say a couple of hours, before frantically starting to search. 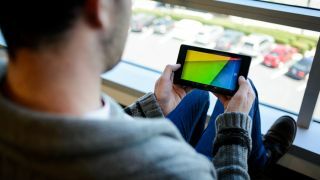 Of those Nexus 7 users suffering with the issue some have enjoyed success by rebooting the tablet, before the problem soon returns, while others have found a resolution by uninstalling the Navigation app or by returning the device to its factory default settings. Are any of you stateside Nexus 7 '2' user experiencing GPS woes? Tell us what's up in the comments section below?